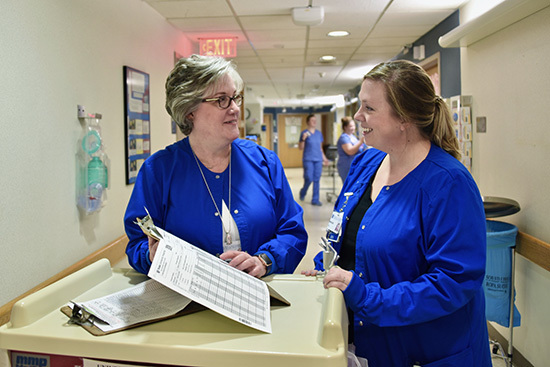 Pamela Bowman, MSN, RN, OCN, Unit 9300, was recently named to receive the 2019 Mary Nowotny Excellence in Cancer Nursing Education Award from the Oncology Nursing Society (ONS). Bowman received her Bachelor of Science in Nursing degree from the University of North Carolina School of Nursing in 2005, and her Master of Science in Nursing Leadership degree from East Carolina University in 2018. The author of multiple publications, she is the recipient of the 2009 Duke University Hospital Friends of Nursing Excellence Award. Bowman is a member of the American Nurses Association (ANA); the North Carolina Nurses Association (NCNA); the Oncology Nursing Society (ONS); and the Sigma Theta Tau Honor Society. She volunteers for Habitat for Humanity Women Build of Orange County and has participated in multiple events supporting cancer research, including the Strikeout for Sarcoma 5K, the Lung Cancer of North Carolina’s Lunge Forward walk, and the Susan G. Komen Race for the Cure. Bowman will receive her award in April at the ONS 44th Annual Congress in Anaheim, California. For more information on the ONS Excellence In Cancer Nursing Education Award and other awards presented by the Oncology Nursing Society, visit ons.org.